First, let's talk about the installation. Here are the 2 saws side by side. Note the height of the handles on both saw. You will notice that the handles are basically at the same height. This was not the case until last night. When the old saw was in use, that 2-piece white counter top was a single piece. The cabinet was as tall as the dresser and the old saw sat where new saw sits, but was about 4" higher. When I needed to cut long boards, I used those 2 supports you see to the right of the old saw in the 2nd image. Inside the cabinet is a mini shop-vac for dust collection. The white unit on the side of the saw is the remote control for the shop-vac. 1 - The handle was way too high to be used comfortably by a 5'4" person. 2 - The saw was much wider and stuck out beyond the front of the counter top. Now, based on the fact that the old saw sat on the same plane as the "extension table" things did not have to be perfectly level, but they were very close. I had wooden shims under the dresser and cabinet to get the counter level with the main workbench, etc. However, since the new saw was too high, I needed to make some modifications. First, I cut the cabinet down by about 4". Then I cut the counter top so I had a section the same width as the new saw. I then installed leveling legs on the dresser and cabinet so I could get everything dead nuts level. Next, I slid the saw's counter top section forward so that it fully support ed the saw and screwed it to the top of the cabinet. Finally, since the cabine t was now front-heavy and I got a little movement when the glide mechanism was extended, I used a large L-bracket to secure the cabinet to a stud. Now everything is level and secure. 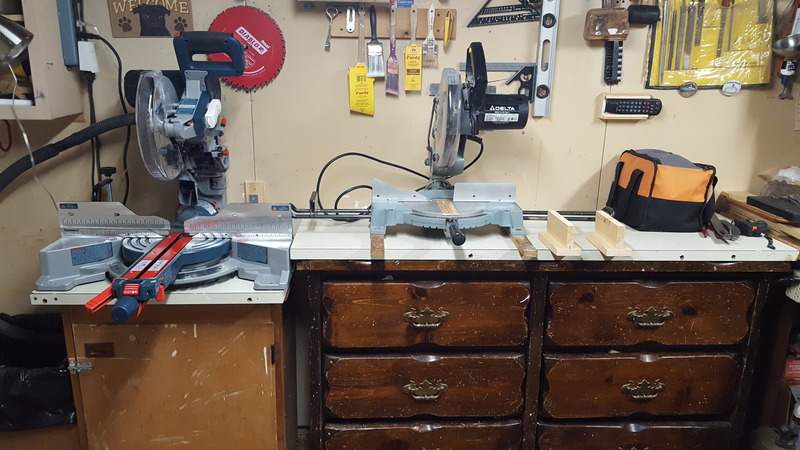 While the counter top on the dresser (the extension portion) is recessed compared to the front of the saw, it is fine for boards up to about 7-8". For wider boards, it can be slid away from the wall and clamped down to provide support. Now, for some comments on the saw itself. Out of the box, the saw needed very little adjustment. The 90°-to-the- fence needed a slight tweak, which was very easy. There are 4 screws recessed int o the miter scale. When you loosen these screws, you can rotate the table unt il until the blade is square to the fence(s). On the Delta, you adjusted the single piece fence which tended to move when you tightened the bolts. 90°-to-the-table was fine. I haven't played with any of the bevel feat ures other than to ensure that the saw does indeed tilt both right and left. The miter gauge detent override could be useful when cutting angles that ar e very close to a detent stop, causing the saw to want to pop into the detent . There is a depth stop so that (supposedly) dados could be cut, but there is far too much vertical play in the head assembly to get anything near a smooth bottomed cut. Even the manual states (twice) that the groove cutting feature is simply a "convenient alternative" when a table saw is not availa ble. There is also a lock lever that locks the head assembly at a couple of front-back intervals for "maximum capacity chop cuts in up-right material and crown molding". Miter cuts go up to 52° left, 60° right. Dust collection is much, much better than the Delta, but that's all I have to compare it too. Reviews say it is so-so. I will probably add a surround like I had for my Delta just to keep the excess contained. I'm not impressed with the Bosch 60 tooth blade that came with the saw. I seem to get a lot of tear out at the back of the cut, but I haven't added a zero clearance fence yet. Changing the blade requires the removal of a "knob" (removed from the saw body but captured in flat bar so it is not a loose piece) and the loosening of 2 screws. The Delta only required the rem oval of 1 screw, so it's a bit more work to change the blade. The Bosch comes with an allen wrench that is used for all adjustments and blade changing an d the saw has convenient place to store the tool on-board. Even at 64 pounds, the saw is not that bad to carry. With the head assembly set at 45° the carrying recesses on the base work really well. Althoug h it's heavier, it's actually easier to carry than the 53 pound Delta. The sliding operation is very smooth, the cuts are square, the saw is quiet er than the Delta. There is about 1/8" of front-back play in the head assembly when it is locked in the fixed position. I don't know if that is common to all sliding saws or just the glide style or maybe just this particular saw. The locking mechanism is nothing more than a flat bar that pivots into a slot in one of the glide hinges. That's where all the play is. There does n ot appear to be any adjustment that can be made to eliminate the play. It's no biggy, it's just "different" than the Delta. I plan to call Bosch on Monday just to check. That's it for now. Once I get busy working on the bookcases that SWMBO want s, I'll know more. If anyone has any specific questions or techniques that the y want me to try, let me know. FWIW the saw is not tiny and I was beginning to think that it was bigger than I realized. I went to a new Lowe's yesterday, actually the very first day the store was open, All of the sliding saws were enormous. Oddly they had no Bosch miter saws. It is unfortunate that miter saws come with blades. It would be nice if you could buy the saw with out. I understand that there is a black piece in the middle of the hinges that you can adjust to increase or decrease the amount of effort to slide the saw. I was not impressed with the blade on my DeWalt either. A friend wanted to cut quite a bit of laminate floor. I figured correctly it would trash the blade so he would pay for a new one for use of the saw. When done, the blade was horrid. I was going to buy a new one but decided instead to send it to Ridge Carbide for sharpening. It came back and WOW, what a difference. Much better than new. Still using it. To be fair these saws were designed for rough carpentry and trim work by the guys in the trades. I think the Kapex is probably the only one designed for a wood worker that deals mostly with hardwoods. So the stock blades are probably fine for those applications. I would put the Bosch miter saw up there as being more suited to the hardwood woodworker. I used to buy Systematic blades and directly from the guy that sharpened my blades. He highly suggested sharpening a brand new blade before it left the store. There was a big difference. Great! You got a slick saw. I'll personally be interested in hearing you thoughts. On Mon, 16 Jan 2017 00:11:04 -0500, "J. Clarke"
And if you don't mind Refurbished, for $30 more than the Amazon Prime price you can get the 12" version of the Bosch from CPO. Thanks, but I certainly don't need a 12" saw, new blades, etc. 1 - No laser. I've lived without one for 15 years. Should that be a major factor in my decision? 2 - 64 lbs! 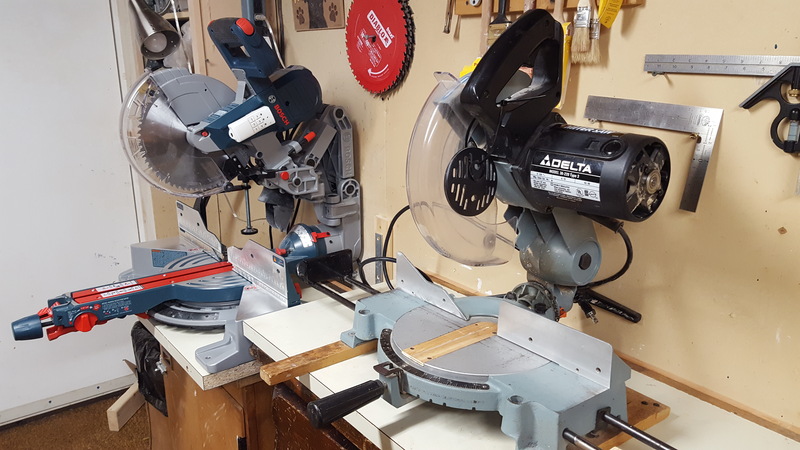 I often take my saw out to the picnic table when I need more room or have a ton of cuts to make or if it's an outdoor project. 64lbs is a lot of saw to lug around. But damn, it sure looks like a nice saw and at 23" I don't think it's any deeper than the Delta. I think a laser would be good IF it works well. I have seen lasers that help if you are blind but not accurate. I simply do not trust lasers for accurate alignment. Yes but that is why it apparently stays set up well. And why I like it. Nice stand. Now I'm up to $900 for that $300 saw I was looking for. After checking with Amazon about return shipping fees if I can't make it fit in my shop, I ordered the Bosch CM10GD. It should be here on Tuesday. I'll let you all know how it works out. Thanks for the suggestions. It's one of those thing that, after you get it, you think, "How did I ever live without this!?" The two lasers on my Delta are easily adjustable and align to both sides of the kerf. When I adjust them to DNOA (dead-nuts-on-accurate) the feature is probably the best part of the saw. I don't ever have to bring the blade down to the line to double-check where the cut will be. I see the laser on the line (or just adjacent to it, depending on preference), hit the switch and pull the saw down. Perfect every time. No, I don't think so. My saw had a laser, it's a defocused piece of junk now and doesn't even slow me down. I just check where the blade tooth hits the board and make my cut. It's going to be the blade teeth making the cut anyway, you can't get more precise feedback than that. You can buy lasers that are held on by the arbor bold. Maybe I'll buy the saw from Zoro. I was joking about the Zoro unit. $400 more for the same saw? How do they expect to sell even a single unit? I saw the Lowe's price. It's only available on line with delivery on 1/27. Amazon would be much quicker.